1. Upgrade to 1Password 4 for iOS (universal iPhone, iPad app), which is on sale for 55% off at $7.99 (normally $17.99) to help with this transition. 2. Switch to Wi-Fi Sync with 1Password 3 for iOS and Mac; 1Password 3 for Windows does not support Wi-Fi sync. As for why couldn’t Agile Bits just update 1Password 3, the answer is they can’t as three former versions of 1Password 3 were removed from the App Store last year with the launch of 1Password 4. Apps removed from sale cannot be updated anymore. 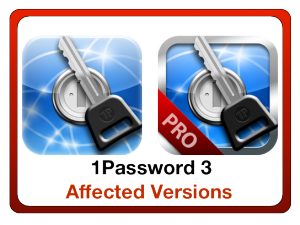 If you’re still using 1Password 3 for iOS, this might be the time to upgrade to 1Password 4. You can’t put a price on convenience when it comes to ease of use with 1Password. Click here to download 1Password 4 for iOS while it’s on sale.